Snap-on Smile provided by Pearl Dental Clinic in Kingston, London. The Snap-On Smile is a revolutionary cosmetic dental appliance that requires no cutting down of tooth tissue and no dental injections. Its exclusive design is strong, flexible, and snaps right over your own natural teeth. It is easily removable, completely reversible, and is an excellent option for patients looking for a non-invasive, temporary, and affordable approach to cosmetic dentistry. What is Snap On Smile made from? The removable device is made from a crystallized acetyl resin. This material is non-toxic. It is very strong and polishes beautifully. Patients can choose from several tooth shades and smile shapes, providing an array of choices for this custom made appliance. One of our cosmetic dentists can assess your eligibility during the FREE Snap-on Smile consultation. We will take photos and impressions of your teeth. You then choose from different smile shapes and shades. The laboratory in USA will then create and send us your new appliance. What is the turnaround time for the appliance? It takes up to 31 days to receive the appliance. The Snap-On Smile Care Kit is a line of care products for cleaning and maintaining your appliance. The kit contains cleaning powder, antibacterial gel, and a storage/carry case. Patients are not limited to what they can eat and drink with their Snap-On Smile. However, we recommend starting with a softer diet and working up to harder foods. Speech can be affected for the first few hours of wear, though this varies from patient to patient. The appliance is expected to last around 12 months with proper care. We do not recommend sleeping with it in place. Will the device look bulky compared to the natural teeth? No. 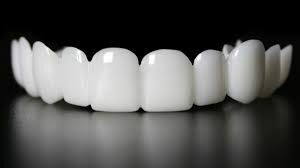 It is the only appliance that can be fabricated with varying thicknesses to afford a more natural contour and look. Can you wear the Snap-On Smile everyday? Everyday wear is possible with this product. We suggest that the patient remove and clean the appliance before going to bed. Does it maintain its colour? Yes, the crystallised resin does not absorb food debris, bacteria, or become discoloured. 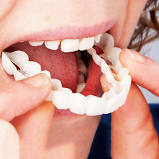 It is durable, resists stains, and allows patients to eat while wearing it. Snap-on Smile costs £995 per arch. At Pearl dental clinic, you can have your Snap-on Smile treatment now and spread the cost of your treatment interest free with our 0% dental finance plans. Pearl Dental Clinic is open 7 days a week from 9am-10pm so that you can have your treatment without having to take time off work. You can book a FREE Snap on Smile Consultation by calling us on 0208 547 9997 or emailing us or book an appointment online.